These two luscious items belong to my friend Jody. She comes into town for our local monthly quilt group meeting. The crooked log cabin is not yet quilted, but the Irish Chain is DONE! 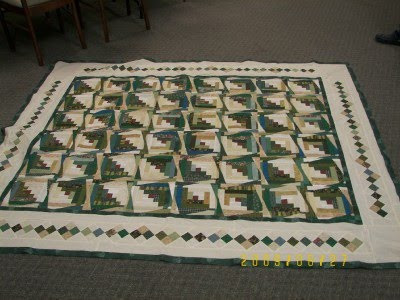 Jody is a ranching woman (among her other talents), and machine quilts beautifully on a frame. This little quilt (below) was mailed today. I tried to drape it artfully on the table like a Country Living photo, but it ended up looking like a quilt, spread out on a table. DH surprised me with this gift, a windmill, a symbol of Nebraska. I've often talked about having a 'real' decorative one for the garden, but our garden never does amount to much, so this metal WELCOME version is much better. I LOVE it! This was made by a guy who makes ranch metal gates with all the cutouts of horses, cowboys, cattle, that we see over the ranch driveways. His wife designs them on a computer. And lastly, yes I DID overdo working and am paying for my exuberant painting efforts, and need to sit down and REST my old bod! Look what came in the mail today! The perfect excuse to sit and enjoy our beautiful afternoon, and a delicious hard lemonade! I LOVE Gwen Marston and Freddy Moran's free use of color, but I also love that it is 126 (correction - 192 pages!!!) pages full of color! Looking at Freddy's and Gwen's quilts will revive you in no time. Painting is HARD work. I need to do some more but I feel the aches coming on just thinking about it. You deserve TWO hard lemonades to have enough time to enjoy those books! Country Living would never hire me to do sets for photos! It looks like Country Living to me -- the porch looks great! As the kids say, "Good job!" Your quilt and your porch look great. I love the windmill. 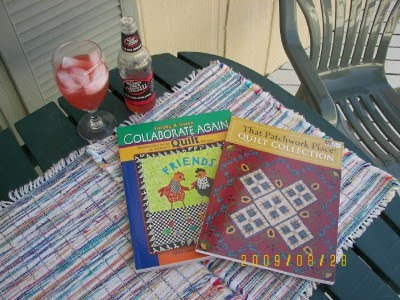 The deck looks very inviting and so does the glass of lemonade and a wonderful pair of quilt books. I love Freddy and Gwen's books and have both of them. Their books always brighten my day and inspire me to explore new things. I hope that you had a lovely time perusing them both. 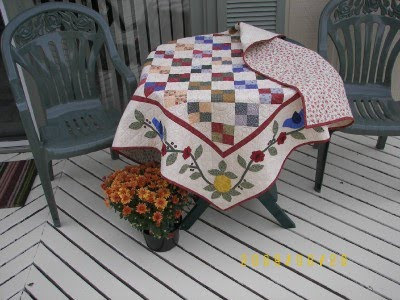 Your friends quilts are stunning and your quilt looked beautiful draped on the table. Hope you are recovered enough to enjoy a fantastic weekend. I love Freddy and Gwen's book. I haven't seen the other one but it looks pretty interesting. 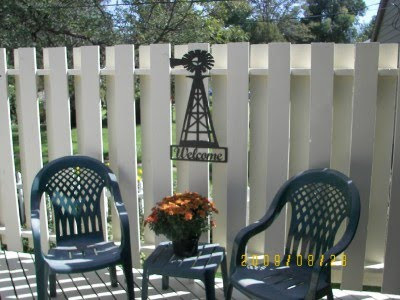 I see that you are set to enjoy your newly painted deck! Your new paint job looks great. What an inviting place to sit and enjoy your new books. The quilty eye candy is wonderful, too. Thamks. Your deck turned out nice - after all that work you deserve to sit and relax a little. Little quilt is pretty sitting on the table too. What a lovely thing to do - enjoy the fruits of your labours on a lovely verandah with good books and a long drink. Sounds wonderful! 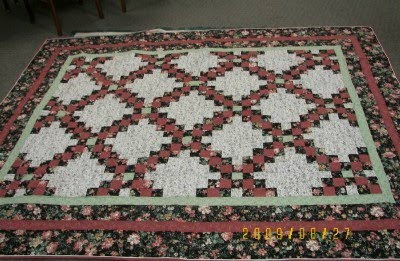 Your friend Jody has done a wonderful job with those quilts! Especially the log cabin. We really need to paint... I love the quilt on the table! it so sweet. Your windmill is very nice too.